The backing up of PCSchool files should be a regular occurrence in case of computer malfunction or user error. It is recommended to back up before completing large processes i.e. End-of-Year Rollovers and payroll runs. This will allow you to reinstate your data to the time immediately prior to the process. 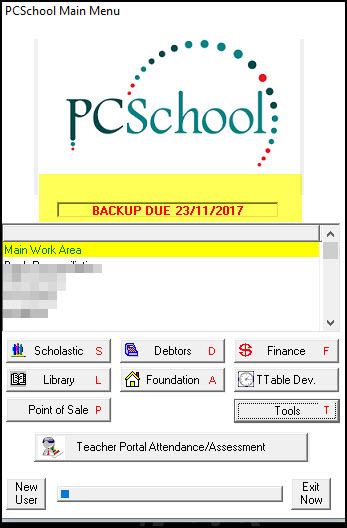 There are three main options when backing up PCSchool internally; backup by module, all files or individual files. The steps are similar for all options. Select files to be backed up. STEP 1 – Select files to be backed up. Select which files you wish to back up. OPTION 1: [By Module] radio button. This will back up all of the relevant files that apply to the module you are currently in (i.e. finance, debtors, scholastic). OPTION 2: [All Files] radio button. This will back up all of the files within PCSchool from all of the modules . OPTION 3: Individual Files. Tick the selected files you wish to back up. If using this option, go straight to Backup Data after you have selected the relevant files you need. If you are backing up by module (Option 1) or all files (Option 2) click the [select all] button so that all files are selected for backing up. Individual files can be deselected at this point by un-ticking check boxes. Click on [Backup Data] button. STEP 2 – Save the backup file. Select the file location where you would like the backup to be saved. You can change the file name to something more relevant if you wish. 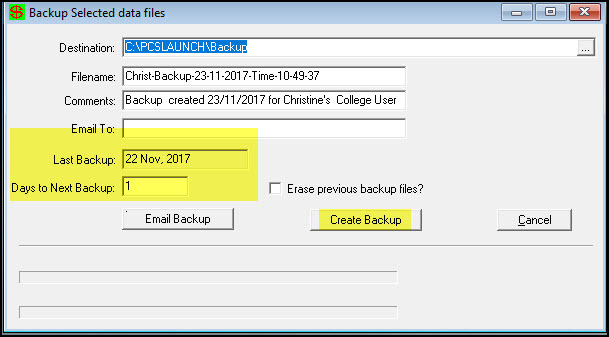 Click on [Create Backup] button. Depending on the number of files being backed up this may take a while – please be patient and let it run. Click on the [OK] button when the backup complete pop up box appears. Always check to see if the file is in the location you expect it to be in. This completes the process.